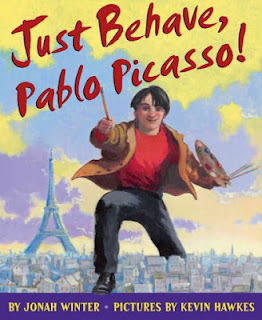 Those looking for an attractive book on Picasso for young readers should check out Jonah Winter's picture book, Just Behave, Pablo Picasso!, released in February of 2012 and illustrated by the versatile Kevin Hawkes (I'm a big fan of The Wicked Big Toddlah, Library Lion, and A Pig Parade is a Terrible Idea, among others). This book focuses on the early years of Picasso's career. In a highly creative and appropriate opening, the first 2-page illustration shows a bucolic country landscape, a peaceful scene with hills, cows, blue sky and puffy white clouds. But turn the page, and "BLAM! ", the young Pablo is depicted literally bursting through the canvas, almost like a superhero artist, paintbrush in hand. Winter and Hawkes together capture the magnetic force of Picasso's creative personality, with a lively text suited for students in elementary school. Many will identify with Picasso's rebellious personality, as he skips from one style to another and one country to another in what seems a blink of an eye (or in this case the turn of a page). Actual paintings of Picasso, listed at the end of the book, are worked into Hawkes' illustrations, while Picasso's contemporaries proclaim in cartoon-style text bubbles their opinions of Picasso's work. We see Picasso's style evolving to become ever more abstract, and share in the shock of the crowd at the exhibition of Les Demoiselles d'Avignon, now considered one of his greatest works. But despite his early success, Picasso refuses to stay still artistically, and disdains his neighbors, who shout collectively at him during one very funny two-page spread, "Just behave, Pablo Picasso! ", as they point their fingers at him. Picasso, of course ignores them, becoming a "force of nature...the most original artist of his time." An afterword provides more background on Picasso's life. This book would fit very well into a discussion of creativity and different ways of seeing the world, as well as promoting discussion of perseverance in the face of criticism. Pablo Picasso was probably the most famous and most influential artist of the 20th century. His long and storied career encompassed not only painting, but also sculpture, printmaking, ceramics, poetry, photography, and set design. 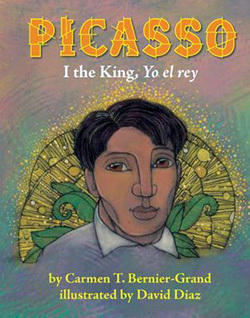 Many books for young people have been published on this great figure, including two in 2012: Picasso: I the King, Yo el rey, by Carmen T. Bernier-Grand, illustrated by Caldecott-winning artist David Diaz (Amazon Children's Publishing, 2012), and Just Behave, Pablo Picasso!, by Jonah Winter, illustrated by Kevin Hawkes (Arthur A. Levine, 2012). 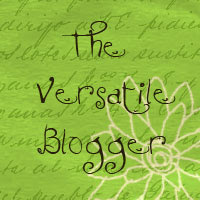 A review of the latter title will appear in my blog tomorrow. Many parents and even teachers don't always realize that picture books are not just for young children. Carmen T. Bernier-Grand's new biography in verse about Pablo Picasso is a perfect example. The author has written a number of biographies in verse (her most recent was on Cuban ballerina Alicia Alonso), and that format that seems particularly appropriate for an artist like Picasso. Bernier-Grand does not white-wash Picasso's personality, and the tales of his womanizing and infidelities are clearly not suitable for young children. In her poem "Gold Crowns," she writes: "As paint is to brush, women are to Picasso's art." Moreover, the tragic events of his life are depicted, such as the early death of his beloved sister and the terrible bombing of Guernica that inspired one of Picasso's most famous paintings. Instead, I would highly recommend this book for middle school, high school, and adults who'd like to explore Picasso's life and work in a beautifully illustrated, easy-to-read format. Because Picasso's life is told through free-verse poetry, much must be left out, but a narrative-style three page essay at the end of the book fills in many of the details, as does a comprehensive chronology of his life. Backmatter also includes a glossary, bibliography, and source notes. David Diaz is a perfect match for illustrating Picasso's life, and the pages seem to glow with deep colors. While his illustrations are representational (no cubist illustrations of Picasso's life!) they have an abstract, stylized quality about them, with a simplification of form that is typical in other books Diaz has illustrated. Photos of some of Picasso's most famous works such as Guernica and Les Demoiselles d'Avignon are included, integrated into the text. 1. Lemony Snicket and Lisa Brown. 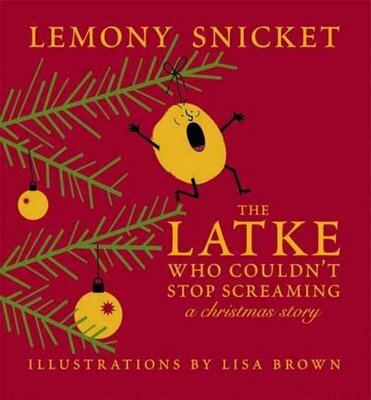 The Latke Who Couldn't Stop Screaming: A Christmas Story (McSweeney's, 2007). 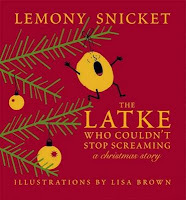 From one of our greatest contemporary Jewish children's writers, Lemony Snicket, aka Daniel Handler, and his wife, the witty illustrator Lisa Brown, comes this hilarious picture book about a latke who has had it up to here with trying to explain Hanukkah to all kinds of Christmas symbols, from candy canes to pine trees. He can't help screaming because Hanukkah is not a Jewish Christmas! 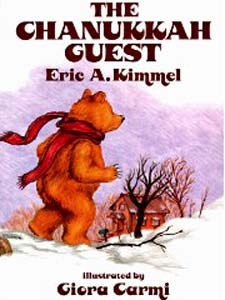 Absolutely pitch perfect for American Jewish children who are deluged with Christmas symbols in December, and a great read-aloud--the kids will love to join in with the latke as he screams his way through the book. A Lemony-Snicket worthy ending will please Snicket's many fans as well. 2. Jane Yolen and Mark Teague. How do Dinosaurs Say Happy Chanukah? (Blue Sky Press, 2012). Those fabulous dinosaurs obviously come from a multicultural home, since this year the celebrated author and illustrator team have released both a Christmas and Chanukah title featuring the adorable dinosaurs of How do Dinosaurs Say Good Night? and so many other beloved picture books and board books. Toddlers and preschoolers will surely giggle to see their favorite dinosaurs being mischievous and squeezing the Chanukah gelt (chocolate coins), fidgeting during prayers, and more. Of course they eventually learn the proper way to behave, and how to enjoy the holiday as well. 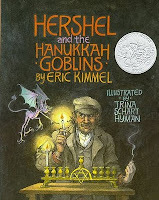 This is a great one to read aloud to younger children, or to purchase as a Hanukkah gift. 3. Eric Kimmel and Gloria Carmi. The Chanukkah Guest (Holiday House, 1992). 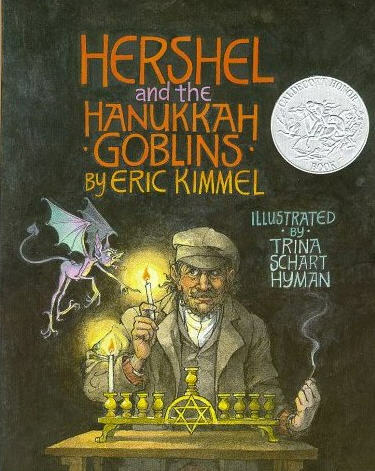 Eric Kimmel is the most prolific of our Hanukkah picture book writers, with ten different titles available, some with single stories, and others which are compilations of multiple stories. This older title is my personal favorite. A delightful comic story set in the Old Country, The Chanukkah Guest revolves around Bubba Brayna, a grandmother so old she's almost blind and deaf, but she still makes the best potato latkes in the village. 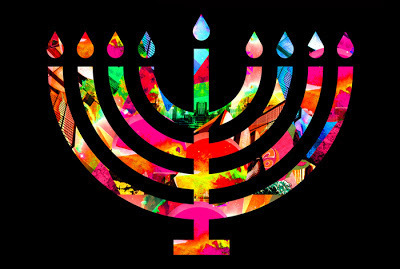 On the first night of Hanukkah, she makes a special batch for the rabbi, but when she lets in her guest, she's in for a surprise. It turns out to be a hungry bear, but she can't tell the difference between the bear and the rabbi! It doesn't matter, because the bear quite clearly enjoys the latkes...only what is Bubba to do when the rabbi finally arrives and no latkes are left? 5. Erica Silverman and Steven d'Amico. 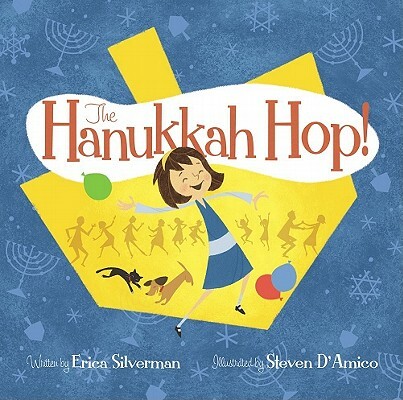 The Hanukkah Hop (Simon & Schuster, 2011). 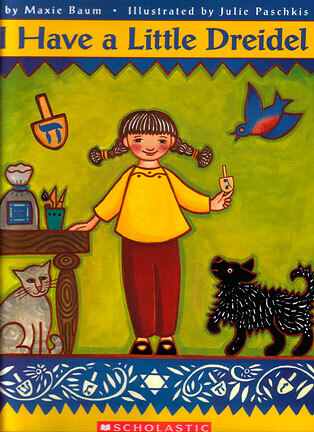 The author of the popular Cowgirl Kate and Cocoa series spins a light-hearted, rollicking and fresh Hanukkah story as a contemporary young girl, Rachel, be-bops and dances her way through a rhythmic Hanukkah celebration, complete with dreidel spinning, candle lighting, latke eating, and of course dancing to a traditional klezmer band. The book features a repetitive rhythmic refrain which adds a joyous touch to the tale. The lively and colorful illustrations add to the fun. 6. Issac Bashevis Singer and Maurice Sendak. 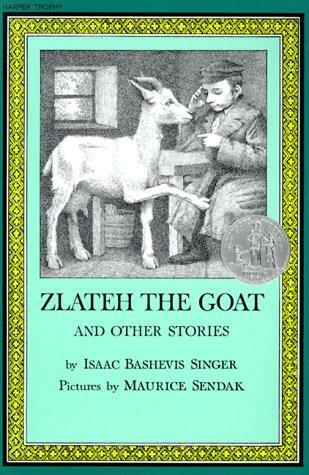 Zlateh the Goat and Other Stories (Harper Collins, 2001--originally published 1966). As far as I'm concerned, Issac Bashevis Singer's wonderful stories about the Polish town of Chelm belong on every child's bookshelf, Jewish or not. 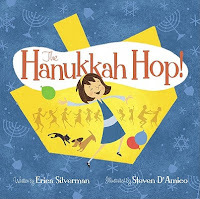 While not all the stories in this collection have to do with Hanukkah, the title story, Zlateh the Goat, is a Hanukkah tale, and makes an excellent read-aloud for older children. In this touching story, a family decides that they must sell their dairy goat in order to have money for Hanukkah and other necessities. Twelve-year old Aaron is charged with taking Zlateh to sell to the butcher, but on the way, a terrible snow storm hits. Zlateh's milk and warmth save the boy's life as they burrow into a haystack, and when they return the family cannot bear to be parted from her. Who better to illustrate these stories than the inimitable Maurice Sendak; his drawings evoke the pathos and humor of the lost Jewish world of Eastern Europe, and his artwork combined with Singer's stories make a true classic (and Newbery Honor book). If you've never read these, give yourself a Hanukkah treat and get your hands on a copy (and no calories involved). 8. Sharon Robinson and E. B. Lewis. 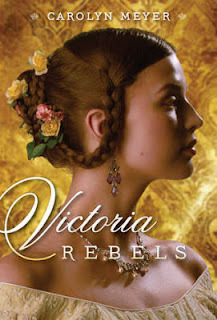 Jackie's Gift (Viking Juvenile, 2010). 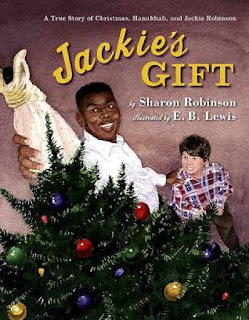 This engaging picture book offers a touching and funny true story about baseball legend Jackie Robinson, written by his own daughter. Young Steve Satlow is a huge baseball fan, and it's a dream come true when star Dodger player Jackie Robinson and his family move onto their block in their Brooklyn neighborhood. We learn that some of their neighbors had tried to stop the Robinson family from being able to move into the neighborhood, but Steve's Jewish parents had refused to sign the petition. Steve and his family befriend the Robinsons, and when the holidays come around, Steve is invited over to help trim the Robinsons' tree. When Jackie Robinson arrives at Steve's house with a Christmas true under his arm, not realizing that the Satlows are Jewish and don't celebrate the holiday, Steve's parents don't know what to do, since to them the tree is a religious symbol. E.B. Lewis' trademark watercolor illustrations lend a nostalgic mood to the 1940's setting. I would recommend this book for Jewish and Christian families alike, since it offers a subtle message of accepting all religious faiths which is well-suited to the holiday season. For another take on Hanukkah favorites for kids of all ages, I recommend the Jewish Library Association's new Hanukkah Read-up, a printer-friendly list of recommended titles for different ages. 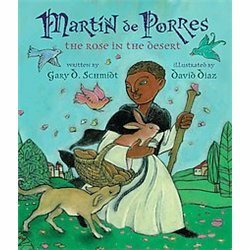 Newbery-honor winning novelist Gary D. Schmidt and Caldecott-winning illustrator David Diaz together have created a beautiful and moving portrait of Martin de Porres, a 17th century Peruvian saint. I was completely unfamiliar with this remarkable individual, an illegitimate child both to a former African slave and a Spanish conqueror. He grew up in poverty until the age of eight, when his noble father came from Ecuador and took Martin and his sister Juana back with him to raise. Later apprenticed to a doctor-barber, Martin showed a talent for healing and a religious calling. But the local prior, prejudiced against Martin's dark skin, would not let him to train to be a priest. Instead, he became a servant at the monastery. Martin's talent for healing dogs and befriending animals of all kinds began to be known, and the local people as well as the monks soon began to ask Martin to doctor them. Eventually he was allowed to take vows as a priest, and he continued to work miracles as the "rose in the desert." Schmidt's lyrical text and Diaz' beautifully realized illustrations combine to make this a stellar offering for those looking for inspirational stories about saints or other religious figures to share with their children. Diaz illustrations are rendered with a flat, stylized method and are colored with rich, jewel-like tones. Many of the illustrations have a dream-like quality suited to rendering the miracles described in the text. Like Saint Francis of Assisi, Martin was known for his work with animals and with the poor. Unlike Saint Francis, however, Martin came from an underprivileged background himself. A brief Author's Note tells the reader that Martin was made a saint in 1962, the first black saint in the Americas. He is now known as the patron saint of interracial relations, social justice, those of mixed race, and animal shelters.